When I was a student at Burnley Horticultural College in the mid ’70s I learnt to propagate this same vine which we grew carefully in the controlled environment of the greenhouse. I remember being astounded when I first visited Port Douglas (also during the mid ’70s) and observed it growing rampantly outside over the ground as well as climbing nearby trees. I was overawed by the wonders of growth in the tropical environment …… and I still feel the same way although a little daunted when the plant in question is not so desirable. So, back to the one of the Burnley standards “a weed is a plant out of place” and I will continue on my mission to remove Scindapsus from this gully so that the native plants have a chance to flourish and the birds can scratch on the forest floor. And, having got all that off my chest ………… this is a story about wild rice. 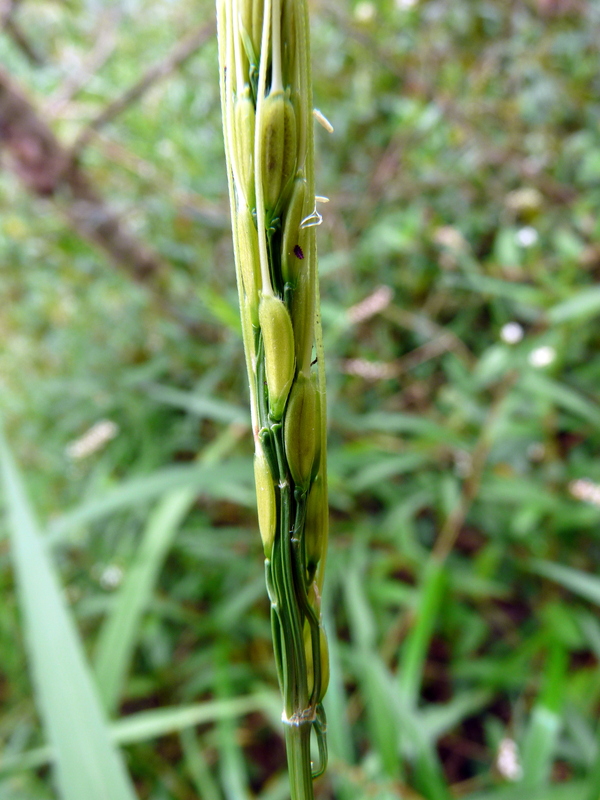 I am aware that Oryza (wild rice) is one of many food plants favoured by Magpie Geese and we have been keen to try and establish some in our wetlands. Eventually, with a little help from nearby friends, we were able to source seed of the perennial Oryza australiensis a somewhat loose panicle of which is pictured below. It is quite difficult to distinguish in the next photo where it is growing amongst Persicaria subsessile with the edible water fern Ceratopteris thalictroides in the background. We aim to encourage a diversity of species in order to provide food and shelter to a range of different creatures. 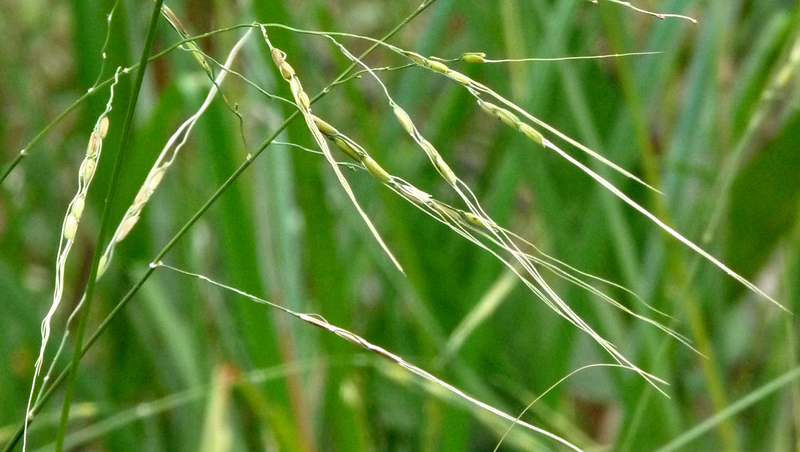 We have also successfully established an annual species, Oryza meridionalis, which forms a sturdy clump and produces wonderfully strong seed heads with extraordinarily long awns which have minute uni-directional barbs that catch on to anything. in a photo but I like the seed heads blowing in the wind. 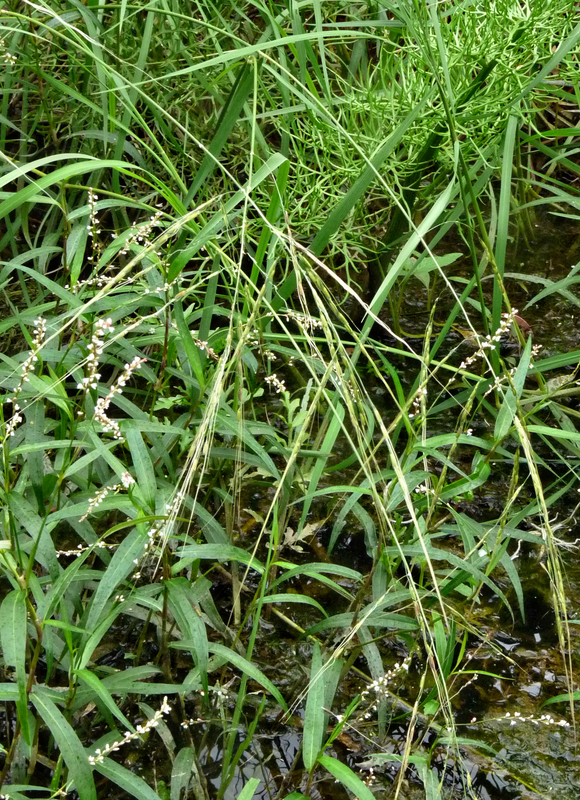 This entry was posted in Wetland plants and tagged Ceratopteris thalictroides, Oryza australiensis, Oryza meridionalis, Persicaria subsessile, Wild rice. Bookmark the permalink. It all sounds like very hard work, indeed! But – how satisfying to create a better environment for the birds and other wildlife! That is definitely worth the time and effort in my opinion. Yes it is worth the effort Mick and although it seemed daunting at first it hasn’t been that bad and now I’m planting a few smaller shrubs that we’ve grown ourselves and that is very satisfying. Hi Barbara. I was looking for info on the Persicaria that we are encouraging in our wetland at Wonga School and came across you and Allen. I’d love to come down to your swampy things and pick your brains, figuratively speaking, for ideas about how to plant out the intermittently wet areas. Every time we get the hymenachnie under controll we just leave a vacuum that gets recolonized, so I’m after some ideas for suitable plants that encourage wildlife and you two sound like you have been doing plenty of thinking along those lines. Hi Rick, we would be happy to show you our wetlands and discuss the pros and cons of various plants we have growing here. Just give us a call and we’ll arrange a time.